Does Eating Fruit Make You Hungrier? 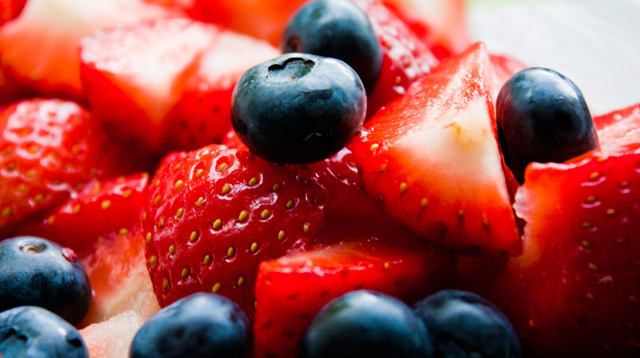 New science suggests the sugars found in fruit may mess with your brain and your appetite. Fruit might sound like a smart snack, but new research suggests the brain does a weird thing when you consume fructose, the sugar found in both fruit and processed sweets: It makes you want to eat even more. In the study, researchers from Keck School of Medicine of the University of Southern California (USC) gave 24 adults a drink sweetened with fructose or glucose, the kind of sugar found in complex carbs in whole grains and veggies. Afterward, they showed participants photos of high-calorie foods like chocolate cake and used special brain imaging technology to monitor the brain areas that affect appetite. Researchers also administered blood tests and asked participants to rate their hunger. Even though both drinks contained the same number of calories and about as much sugar as a dozen oranges, glucose drinkers had higher levels of blood sugar and insulin, which are associated with satiety, than fructose drinkers. Meanwhile, the fructose drinkers' brains were more responsive to the food photos than glucose drinkers' brains, which suggests that fructose increased people's desire to eat more than glucose. Experts chalk it up to hormones: "When we consume glucose, a number of hormones are produced in the body and they help us feel full. If we consume pure fructose, we don't get the production of those appetite suppressing hormones," says study author Kathleen Page, M.D., assistant professor of internal medicine at USC. You already know you're supposed to limit fruit juices and sodas sweetened with high-fructose corn syrup. However, these study results suggest that naturally-occuring fructose could, at least in theory, mess with your appetite too—that eating fruit could make you eat more calories overall, and ultimately cause weight gain with associated health issues. While more research is needed to see whether solid fructose has the same effects as fructose-sweetened liquids, don't expect an apple to give you the grumbles, Page says. Fruit contains fiber, which slows down the absorption of fructose and helps you feel full. So it probably won't stoke your appetite as much as processed sweets made with, say, high-fructose corn syrup. But if you are worried, eat your fruit with some sort of protein (like peanut butter or cheese): the combo will help you feel full for longer, which is exactly what a smart snack should do.